A bee dance is a dance performed by bees to lead other bees to food sources. There are two types of dances, the figure eight dance and the waggle dance. Karl von Frisch was the discoverer of the bee dance. The around dancing is made in order to indicate (namely, within a range of 50 meters) nearby sources of food to the other bees. Here, the worker bee will first move very wild on a comb to the top and push other bees so they get the full attention. She lets briefly taste the food of the source. Hereafter, the excited worker is walking in a small circle with in the middle but one brood cell. Attentive other workers walk behind her. After several full circles she turns around and walks in the opposite direction, with some workers again behind her. This dance can take around 10 minutes. Then the worker bee again lets taste a little of food and follows a repeat of the dance. The worker flies away and the other workers can find the source on their own. 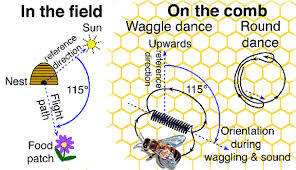 The waggle dance starts the same. This dance is performed when the food is more than 50 meters away. The excited worker pushes against other workers and let them taste it. Afterwards the worker runs in a semicircle. At the end of this circle, they will in a straight line go back to the starting point. During the straight path she wags her abdomen (hence the name, waggle dance). Then she repeats the semi-circle and the straight section, but then in the other direction. In this dance, the other workers also receive information about the direction and distance to the source. The angle that the worker makes with the vertical axis (for this dance is done upwards), is the angle of the path to the source relative to the sun. The distance is indicated by the speed with which the bee dances. The faster is danced, the closer the food source.